I am sure that you have heard of the old saying 'Long Live The King'. But have you ever heard of the alternate phrasing for this piece? 'Long Live The King, Just As Long As He Does Not Shack Up With Some American Bint'? No? Then you best watch this one hour Channel Four documentary made in 2012. It's a real eye opener I can tell you. In this one hour documentary, narrator, Steve John Shepherd, tells the tale of a secret battle between His Royal Highness, Edward VIII, and Archbishop Cosmo Gordon Lang, concerning the erstwhile Monarchs right to the throne. Now this program is lavished with a very complementary selection of archive footage, radio commentary, images from that time, plus one on one interviews with specialists such as, Hugo Vickers, Philip Ziegler, Susan Williams, Matthew Grimley, and Robert Beaken. What was Edward VIII like a person? Edward was a very liberal person by nature, with a congenial charm and modern outlook on life, whilst having a distain for the regimental and structured approach of the 'old guard'. What was Archbishop Cosmo Gordon Lang like as a person? Cosmo was a religious figure who wanted to preserve traditional values and popularize the Church in the eyes of waning Britain. Moreover, because of his ultra-conservative temperament, he was well respected by Edwards Father, King George V, as well. How did the emergence of Wallis Simpson drive a wedge between these two opposing figures? When Edward started 'dating' Wallis Simpson, Cosmo saw this act as an affront to his own Christian beliefs, due to the fact that she was an American lady who had been married twice before. Who were the 'The Old Gang'? And what role did they play in these proceedings? This fringe group of advisers to Royalty, Church, and Politician alike, acted as a secret task force whom busied themselves with gathering information relating to Edward and Ms Simpson's activities, and then relaying them back to Cosmo. What caused Cosmo and Edward to start their secret battle together? Once Edward's Father died, Cosmo wanted to mold Edward into his Fathers image. However, Edward did not want this at all, and he tried his best to distance himself from both Cosmo and the Church, by subverting the old ways and looking towards the future. What was the 'Cornwall Plan'? When Cosmo attempted to blackmail Edward by threatening to expose his relationship with Wallis Simpson in the press, Winston Churchill devised a compromise of sorts - stating that she could become the next Duchess of Cornwall, instead of the next Queen. Did this plan work? No. The then prime minister, Stanley Baldwin, helped Cosmo leak out numerous articles into the media, attempting to discredit Edward's relationship with Wallis, plus him as a sane person. Now please note, although Cosmo's and Stanley's plan backfired on them both, Edward still abdicated from the throne, inadvertently causing Cosmo to fall onto his own smug and self-righteousness sword. 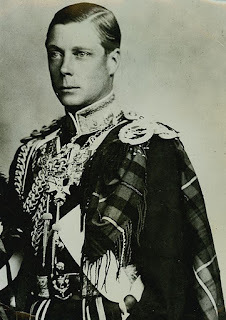 After watching this documentary, 'Edward VIII - The Plot To Topple A King', I could not help but conjure up three relatable scenarios within my mind to reflect this piece retroactively. Conceptually, this real life tale reminds me of the usual superhero battle between good and evil. You know the type of thing I'm sure. Superman verses Lex Luthor. Batman verses The Joker. Britney Spears verses her breasts. But in this case, the bad guy actually wins. OK, not an outright win, granted. Nonetheless, at the end of the day the 'villain' does manage to do what he set out to accomplish - defrock the throne - and in so doing, trip over his own ego in the process. So what does this tell us about post World War 2 Britain, huh? Correct. That 'the good old days' were not always so good, because 'those on high' had a moral center that was steeped in bigotry and in contempt for the coming of a new age. Well, would anybody today give a toss today if Kate Middleton were a divorcee? Or for that matter an American? No. Don't think so. Fair enough, I am sure that this type of gossip would cause a little sh*t-stirring amongst the masses. But by in large this type of fact would be nothing more than a footnote in Wikipedia. Like Edward and Cosmo, back in the day I had my own arch-nemesis as well. Roland was his name, and he was the type of person that I could not stand. He was pompous. Righteous. A bit of a prick. And had a very snooty way about him that got on my bloody nerves whenever we met. Worst still, he was my boss. So what could I do about it, huh? He hated me and I hated him. Though we had to find a way to work together, or otherwise we'd end up wanting to smash each other's faces in. You see, over time we just 'put up' with each other's habits. Because our mutual hatred was something we could not justify in the work place. Therefore, my question is, if me and Roland could reach a mutual understanding between us, why couldn't Edward and Cosmo? SCENARIO THREE: WHAT OF THE FUTURE? In this documentary there was a possible solution which could have made Edward a King - 'The Cornwall Plan'. Now a small part of me is just curious as to why this plan was not put into action. Edward had the British people behind him. And they did have a way of tolerating change at that time, as noted in other event during that era. So why wasn't it given a chance? What made Edward decide on his fate due to a ploy by the church? OK, I understand that they were gunning for him with every move he made. Plus I am in no position to judge this one time monarch actions either. Still, it is something that is curious to comprehend. Isn't it? What would have happened to England and Wallis Simpson if Edward was crowned King? 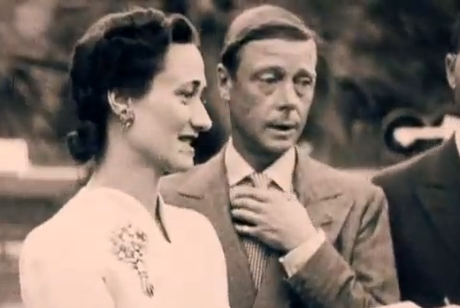 Overall 'Edward VIII - The Plot To Topple A King' is one of those programs that really got my blood boiling. I thought that weird chap from Eastender's did a really nice job of narrating this piece. I also got a kick out of looking at the archive footage, and peeking into the diaries and secret documents of the players involved. Moreover, the re-enactments really did help tell this tale as well, complementing what we heard in a concise and well presented visual form. Oh! And I best mention that I thought that both Philip Ziegler and Robert Beaken were stand out specialist in this program. I could almost feel their and passion and their excitement within every word they said. Agreed Eddy?